I don't cover basketball. Obviously. I'll go to a game here and there and I'll always watch on television, but I don't for a second think I can offer much insight other than what's already being reported. But watching this year's team and seeing the struggles of the last 2 seasons only makes me wonder...what could have been? In 2013, Trey Burke led Michigan to 31 wins and the brink of a national title. I thought it would be the start of something special for John Beilein and the Michigan hoops program he resurrected. And for a while, it was. 2014 was another banner year...a Big Ten regular season title, runner up in the conference tournament, a #2 seed in the NCAA tournament, an elite 8 appearance. All accomplished with a team comprised mainly with freshman and sophomores as the primary contributors. They had lost Burke and Tim Hardaway Jr., but it appeared Michigan was simply reloading. And then the doors fell off. 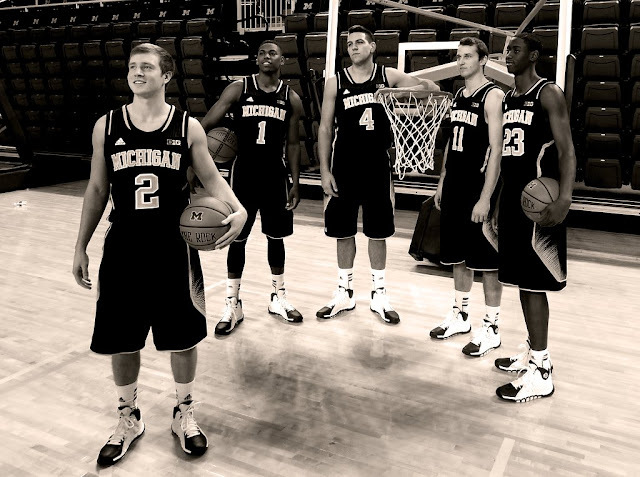 Nik Stauskas, Glenn Robinson III, Mitch McGary, Jon Horford and Jordan Morgan were all gone. And to pour gas on the fire, Derrick Walton and Caris LeVert went down with significant injuries in January of the next season. All of the sudden, Beilein and staff were left with table scraps to try and pull together the thanksgiving feast they'd had the previous two years. 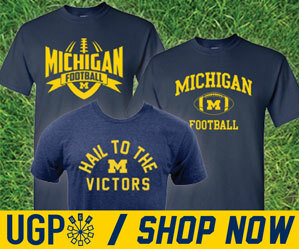 Predictably, Michigan finished 16-16 overall and 9th in the Big Ten at 8-10. They did not participate in any post-season tournaments. This season has been slightly better overall, with some talented, fresh faces stepping up to contribute, but it's far from what could've been. In a perfect-world scenario, Michigan's starting 5 right now would include seniors Nik Stauskas, Glenn Robinson III and Mitch McGary. All three of which bolted for the NBA after their sophomore year. Stauskas was drafted 8th overall in 2014 to the Sacramento Kings where he started one game and was traded after that season to the 76ers, one of the absolute worst franchises in professional sports. He's done moderately well there, starting a handful of games...but like the rest of his team, scoring has been sporadic at best. He's also battled injuries this season. Glenn Robinson III was drafted 40th overall to Minnesota. He never started a game in his rookie year, averaged 1.2 ppg and was waved by the Timberwolves in March of that year. He was picked up on waivers by, you guessed it, the 76ers...who opted not to make a qualifying offer before the July 1st signing period. He joined the Atlanta Hawks summer league team and eventually signed a deal with the Indiana Pacers. After a couple months he was assigned to the NBA D-league. Mitch McGary was drafted 21st overall by the Oklahoma City Thunder. He started 2 games in his rookie year and averaged 6.3 ppg. He was just recalled from the D-league but it's likely he'll struggle for playing time being buried on the depth chart. I will be the first to admit that I am not a basketball guru. I don't know the first thing about the NBA works or how players are moved around. I assume, like most, that when a kid leaves a championship-level college program after 2 years it's because the money is simply too good to pass up. Stauskas signed a 4.5 million dollar deal, GRIII's contract with the Pacers is worth around 3.2 million, and Mitch McGary is bringing home around 4.3 million. That's a lot of cash, and admittedly, it's hard to ignore those numbers if you're a sophomore sitting in your dorm room. But sitting here almost two years later, with these three guys and the program they left behind not exactly living up to previous expectations...I wonder, was it really all worth it? I know I'm painting a perfect-world picture here, but try to imagine all that talent still in Ann Arbor...and even if it was for just one more year. Man...the things they could've done. I remember thinking the same thing with the Fab 5 back in the mid-90's. But I'm not naive...money is king and college is simply just a means to an end for a lot of these kids...a stepping stone. I'm just a biased fan I guess. I give John Beilein a TON of credit for pulling together all he could in the wake of his entire 2013 national runner-up team being drafted early in two years and the glut of injuries his team has had to endure as well. It's been an uphill battle all the way. The good news is Beilein is a heckuva coach. The Michigan hoops program is on more solid ground than it's been on in a long time. From this outsider's perceptive, I think the future is bright. But man...what could have been.